A baseball player would not leave for the game without a glove and a bat, just as a sculptor is not expected to choose between a chisel or hammer. So why do so many marketing professionals practice their trade with an incomplete set of marketing analytic tools. 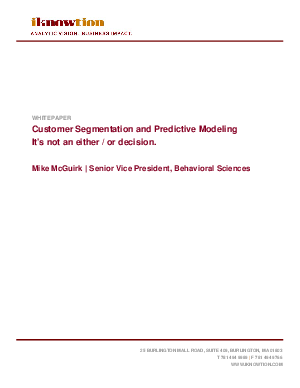 Two must-have tools are customer segmentation and predictive models. The truth is, the terms "customer segmentation" and "customer predictive modeling" are often used interchangeably when in fact they are very different and support different business objectives. This paper will begin to clarify these differences and explain why both tools, not one or the other, are required to effectively compete in today's customer centric marketing landscape. The emphasis will be on the suitable marketing applications of segmentation and modeling as opposed to an overview of the differences from an analytic technique perspective. In an effort to make the concepts less abstract, use case examples are provided throughout.